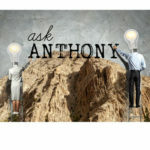 Ask Anthony: Do I Better Position Myself for CE Success by Becoming an Expert in a Defined Niche? This is a question I struggled with myself when I started out as a young civil engineer working in the field of land development. When you work in land development, there are many different aspects to a project, so I ended up learning enough about each one of them to ensure successful project completions. However, looking back, I wish I’d taken a different approach. I wish I had selected a specific niche or focus and became an expert in it, like stormwater for example. 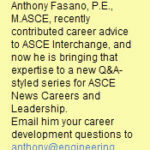 Lucky for me, that was only the first part of my civil engineering career. About five years later, I was asked to relocate to a new office in an area where acres of farmland were being turned into housing developments, and this time I decided to select and foster an expertise. I noticed that most of the communities in which we were working didn’t have a municipal sewer system, that instead the homes used individual septic systems. I decided I’d start learning about septic systems by reading everything I could, including the current regulations. In turn, and maybe partly because there were only a few of us in the office, I became the go-to person for all things septic systems, from the initial soil samples to the design and eventually construction inspection. I then took it one step further. We had started to notice that the sites we were working on had limited amounts of flat area that fell within the slope regulations for septic system installation. So if a site wasn’t flat enough for a septic system, it either became unbuildable or else required a very expensive and often cost-prohibitive alternative fill system. I decided to do some research and found a third-party septic field product which used a technology that decreased the area of the system footprint. Unfortunately, this system hadn’t yet been accepted for use in the county where we were working. I asked the County Health Department if they would consider the product if we provided information as to its benefits, and they said they would consider it. With the support of my engineering firm at the time, I embarked on a several-month project during which I researched, tested, and provided case studies of this product, and through this effort, the product was eventually accepted by the county. This was a huge win for our company and our clients, and in turn, for me. I had consolidated my reputation as a go-to expert in septic systems in this state, and that would help me tremendously in building my career as a successful civil engineer. In my next post I’ll lay out some general steps you can take to build an expertise in a specific specialty within civil engineering, but the point of this story is to make you aware of the power you can find in doing this. I know it can seem risky to put all of your eggs in one basket – and in this post I give examples of when you should be more general – but I would make the case that it’s actually the opposite. Why? Because most people don’t do it, which means that there are many avenues of civil engineering that could use more experts, and when you are considered a leading expert in a field, opportunities will flow your way. Good feedback Matt — I guess my point was if you become a go-to expert in a field, the work will find you. But you’re right, a lot of people will keep their skill sets broad and focus on a few which will work too. 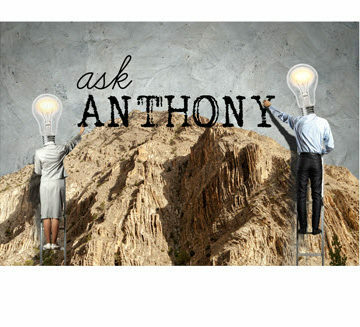 But I just think if someone really wants to be a super-expert in a niche, the resources are available today to do that. When I was an undergrad 50+ years ago, I took both the structural and the “municipal” engineering (“sanitary engineering”) options. I was recruited by the Los Angeles County Flood Control District and worked in their design division doing flood control channel designs and hydraulics — something I never learned in college. So I learned that. I then went on to a large A/E firm and did everything from commercial site development, to college water and wastewater systems, in addition to storm drains and airport drainage. I left and worked for an environmental firm doing industrial wastewater and municipal wastewater treatment, water recycling and water treatment. Now I’m a full time professor and consult in the area of water and wastewater. The broad background helps me understand the issues other engineers, my colleagues, face on various engineering projects. My recommendation is to try to get as much varied experience as possible; certainly before you take the PE exam which requires knowledge in many areas. This background allowed me to enjoy my career and continue to learn. There was never a day I didn’t want to go to work. It was always a challenge . Long story short, although I liked everything I did, it took a while before I found what I found the most interesting and rewarding, And after 53 years of practice, I still find it challenging and rewarding. I did not regret developing a specialization early. I really would not recommend it. Technology changes may make you obsolete. I think that the choice to become a niche expert or not involves many factors. I work for a small public agency and we don’t have room for people who only know one thing. I can certainly see in a larger agency where you will have to be an expert in a particular field to get hired as most positions are very specific. Whether you move around or not also plays into it. I once watched a highly experienced engineer struggle to find a new job because the field he had spent the larger part of his career in had very few openings and was only present in limited areas in the country. That experience alone made me leave that line of work and branch out to expand my skill set. Your example is similar. Being a septic design expert is great, provided you always plan to live and work in an area where septic systems are prevalent. Not going to find many jobs in large urban areas that demand that skill set. My opinion is learn as much as you can. Pick a couple things you enjoy and become an expert in more than one area. That provides some flexibility if you end up having to change jobs along the way.